Student groups from five high schools spent the day at Piscataquis Community High School in Guilford for the inaugural Positive Action Team retreat on March 1. Attendees shared ideas for making their schools and communities better places with a day of activities, including hearing from keynote speaker Patrick Veroneau of the Emery Leadership Group. Those involved made a $300 contribution to the Center for Grieving Children in Portland in lieu of Veroneau’s speaking fee. After discussion that day about issues facing young adults and what can be done, Mills encouraged those present to go back to their schools and form a Positive Action Team. “Our group thought if kids had more positive things to do then maybe they would not turn to drugs,” Keane said. The teams have caught on. 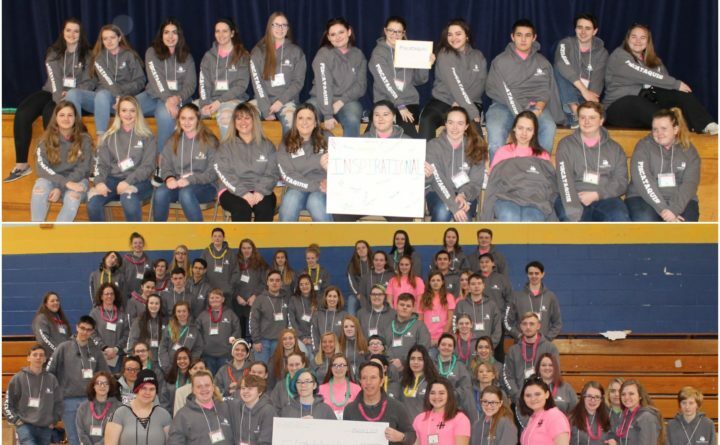 Students from across the region wanting to make a difference in their schools and communities learned what they can do to make it happen at the inaugural Positive Action Team retreat Friday, March 1, at Piscataquis Community High School. The daylong event featured student-led teams from secondary schools in Dexter, Greenville, Milo and the host school as well as Foxcroft Academy students who may form a Positive Action Team at their institution. Retreat activities for the 50-plus attendees included students signing their names and listing positive activities they enjoy such as playing sports, participating in various extracurricular activities, and being thankful for their friends and families. Each school team also came up with one positive word to represent the group — PCHS chose inspirational — and pupils decorated a poster board featuring their choice. Keane, who advises the PCHS Positive Action Team, addressed team members gathered on the bleachers. “First I would like to welcome you all here today. This is so cool to have all of our area high schools represented,” he said. Keane said a second retreat objective was to determine something everyone can do together going forward. Starbird said the four students attending the conference with Mills formed the PCHS Positive Action Team in 2016 and have since worked with the other schools in the region. “I have heard from school leaders that it’s really changed the atmosphere at schools, there is less bullying and more positive attitudes,” she said. “One of the reasons positive action is so powerful is it takes a village, it’s community partners,” Keane said. Area teams work with Mayo Regional Hospital, Partners for Peace, Helping Hands with Heart, corporate sponsors and others. “If you remember anything from my five seconds it’s you matter, you matter incredibly,” she said. In 2017 the PCHS Positive Action Team organized a school-wide garden planting for the The Yellow Tulip Project, started by a Maine high school student who lost two close friends to create awareness and reduce the stigma of mental illness while honoring those who have lost their mental health battle to suicide. While the details are to be determined, the five Positive Action Teams ended the day with a topic of substance use and mental health awareness and support for a project to work on together. The topic includes suicide prevention education, stress management, anxiety and depression, time management, nutrition, and health. The issue of food access and food insecurity was also brought up for retreat participants to think about. “It’s OK to be part of this stuff and be a leader and step up, I feel that’s a really important message,” Goggin said, with Hill adding that being involved with the Positive Action Team is also a great deal of fun.